I feel like we say this all the time but, we both really wanted to come to Turkey for as long as we can remember. Maybe more specifically, Istanbul, but we want to explore it all. We had a short trip to Istanbul that has left us wanting to see and explore more of this amazing place. There's so much happening here that begs to be explored. Hopefully we will have a chance to do so soon, but until then, we have our memories of Istanbul to keep us wanting more. 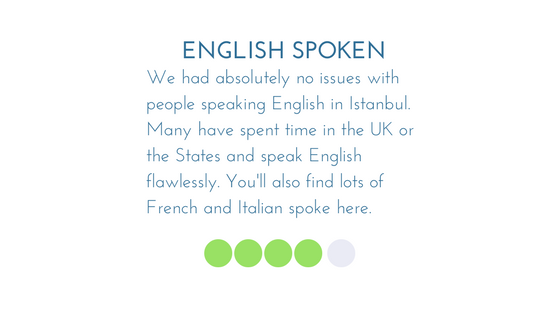 Read, see and hear more about the regions we visited in the Turkey. An overview of our stay in Istanbul. Find out why we loved this city oh so much. Cats are everywhere in Istanbul. They say that there is one cat for every person in Istanbul. So if you don't like cats, this post isn't for you. If you DO like cats (like any rational person), you'll find Istanbul to be a magical place. We absolutely loved our stay at Hammamhane in the Beyoglu neighborhood of Istanbul, Turkey. The street is filled with antique shops, restaurants are nearby and the hotel itself is stylish and comfy. Oh and breakfast is incredible too. Our experience on Culinary Backstreets Two Markets Two Continents tour was incredible. It was a day full of stuffing our faces and our brains with info and pure pleasure.